Bypassing McCoy's explanation of his recent cartoon and letting the work speak for itself, this is what I get out of it: an indictment of letting opinions that are shared by a mass of like-minded people lead to expressions of hatred and disrespect. Rockwell's original image beautifully dignified Ruby Bridges in the visual language of 20th century middle-America, and made the audience question itself by positioning every viewer at the front of an implicit hostile crowd. McCoy's ludicrous juxtaposition of Betsy DeVos and Ruby Bridges forced my attention towards the "mob behind the camera" as the true target of the visual analogy. DeVos may well have been flattered in the comparison with Bridges, but the cartoon's provocation seems squarely directed at the ugliness of strong opinions built within cultural echo chambers. 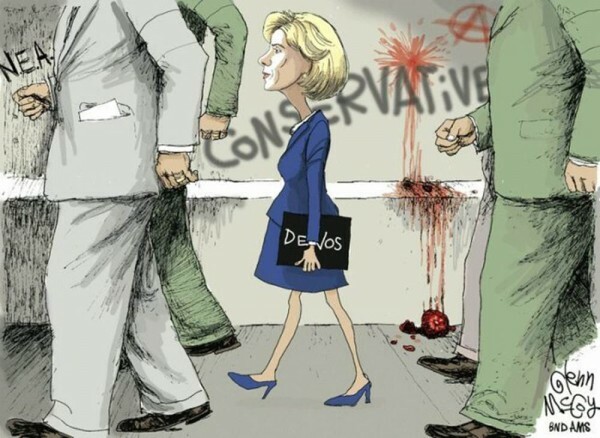 My reaction to all this is in no way tied to opinions on DeVos or even opinions on people who protest against DeVos â€“ McCoy's defense of his work reveals a specific and narrow political agenda; the effect of his cartoon went fairly deep, though. How do we guard ourselves against a threatening bias both within and outside our community? Is a cartoon such as McCoy's a sort of rotten tomato or slur in and of itself (disrespecting well-informed opponents of DeVos)? Do I need to "police" others more urgently than my own self? Is my bias a reflective plane? Our tendency to get lost in the glaring differences between Bridges and DeVos is one of the things we can guard against when we have an opportunity to look at our own actions and reactions. Great work by Norman Rockwell in any case -- although it strikes me that the imagery he used ended up reassuring middle-America that we are not racist ... at least as long as, you know, people look and dress like harmless and well-mannered children going to school. But hey, Rockwell did the best he could â€“ no art is universally perfect, and there's always more work to do.